While a goal for a landscape designer is to create the cleanest, most austere view possible, more adventurous ones will add some industrial elements to create a more visually stimulating scene. While this situation is most often seen in home landscape designs, it can easily be modified for use in commercial landscapes. Add a Visual Focus – A salvaged metal piece can be an unexpected surprise in an otherwise pristine garden. Consider using one as a focal point on a path or in a particularly noticeable spot. Use Mixed Metals – A two-toned, metal fence can be an excellent addition to a commercial landscape. Not only can it hide machinery or other undesirable items, its dual nature can actually enhance the greenery that surrounds it. Try Glass – For a less subtle look, add glass partitions and containers and to your commercial landscape. They add a hardness without intruding upon the color of the space. For more info on this topics in particular and commercial landscaping firms in general , please contact us online at Outdoor Expressions – Making your outdoor space a place to remember. Plant Shade Trees – Placing trees so that they shade your building from the hot summer sun is a great way to lower utility bills. Similarly, adding bushes on the south and west side of AC units will shade them and allow them to operate more efficiently. Add Groundcover – Ground water evaporates quite quickly if not protected from direct sunlight. The use of mulch and live ground cover provides an attractive view that will also conserve the water in the ground. Use Broken Stone Pathways – Solid driveways and pathways are simply heat sinks whereas a broken path dissipates the heat far faster. You will appreciate the difference. For more tips on dealing with the hot Georgia summer, or any other landscaping problem, please contact us online. Outdoor Expressions – Making your outdoor space a place to remember. Keeping a lawn green and healthy may seem like a simple task – just water it regularly and hope that the sun comes out. Still, there is somewhat more to keeping that greenspace looking good. Let it Grow – Contrary to conventional wisdom, cutting your lawn too short – that is, by more than one third – does not promote root growth and can actually shock your lawn. Instead, let it grow a little longer than usual and then reduce to the height that you want. Water Properly – Proper watering techniques state that you should water less frequently but for a longer amount of time and at night. With this simple procedure, more of the water will makes it way to the roots of the plant. Fertilize at the Right Time – Similarly, your lawn only wants to be “fed” in the early fall and early spring. In fact, overfeeding can lead to a pest problems and significantly damage your lawn. For more information on these and other commercial landscaping tips, please contact us at Outdoor Expressions. Making your outdoor space a place to remember. The usual approach to commercial landscaping is to plant a variety of swiftly growing plants, bushes and plants and hope for the best. While this strategy does work, it also overlooks some of the more subtle effects that can be created if ones makes just a little more efforts and takes a little more time. In particular, finely-crafted, geometric motifs can make a significant difference in how your property is perceived. Modern geometric motifs are based on those old English gardens that have impressed generations of tourists but on a far more modest scale. For example, the use of regular, rectilinear stone containers with a free-flowing wall of pines makes an interesting counterpoint to any garden. On the other hand, a curved retaining wall with shrubs that exactly follow its contours is an ideal way to frame a path. In short, the judicious use of geometric shapes makes for a more interesting garden. Try it. For more info on this and other landscaping topics, please visit us online at OutdoorExpressions.net or, if you are in need of a commercial landscaping firm in Atlanta, please call us directly at 888-210-1116. In addition to being one of our most precious natural resources, using water can be quite expensive for the homeowner who doesn’t pay attention. 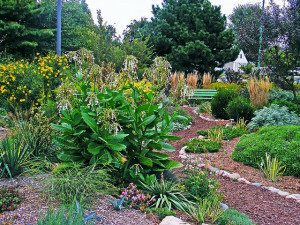 The use of a xeriscape is an excellent way to conserve both your money and our shared environment. Xeriscapy is not so much a design concept as it is an overall philosophy for managing your landscape. For example, it encourages the use of the right types of plants for the soil, water and lighting conditions of your area. This simple approach allows the plants to thrive without placing undue strain on the surrounding ecosystem. Similarly, a well-designed xeriscape will include catch basins for rain and utilize drip irrigation systems to minimize the need for water while still keeping the plants healthy and beautiful. Watering is also done on an as-needed basis rather than a regular schedule. For more information on xeriscapes and on other interesting landscaping projects, please visit us online at OutdoorExpressions.net. Outdoor Expressions – Making your outdoor space a place to remember. Planting – Roses need 5-6 hours of sun per day and a neutral soil. Choose the site with these facts in mind and alter the pH with commercially available chemicals if necessary. Pruning – Always remove any dead or diseased twigs as soon as they are noticed. Also, “deadhead” or remove flowers that are past their prime to encourage further growth this season. Feeding & Watering – Roses love water, and it is almost impossible to give them too much. Fertilizer, however, should be used judiciously, once per month. Feed on the drip line, not at the stem. For more information on roses or on other gardening ideas for Atlanta in general, please contact us online at OutdoorExpressions.net. 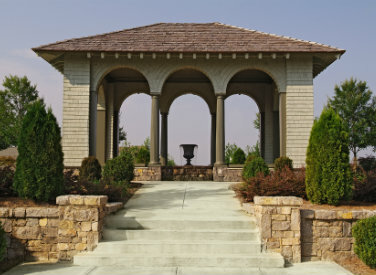 Outdoor Expressions – Making your outdoor space a place to remember.